As cute and cuddly as rabbits may seem on television and in cartoons, the real-life problem of a rabbit infestation on your property is quite a different story altogether. They may seem to be harmless little critters that like to jump around and frolic on the grass, but they have a tendency to cause havoc and damage to all kinds of properties and possessions. It is not uncommon to witness cases where customers have experienced jolts to their livelihoods because of their plants, crops and farmlands being destroyed by unruly rabbits. We have had other clients who have seen their playing fields and grounds ravaged. Even individual homeowners have seen their gardens and paddocks brought to ruin by these pest rabbits. Although it may not seem as if having a few little rabbits hoping around the garden is not such a bad thing, it is necessary to remember how fast rabbits actually reproduce and how quickly a minor problem can turn into a major one. The type of damage that can be caused in the long-term is very difficult to rectify. The optimal solution is to remove the infestation before the animals have a chance to become overwhelming. Rabbit control is therefore a quintessential step in protecting valuable assets. Thus, our goal is to help families and businesses across the UK to eliminate this problem before it gets out of hand. It may seem as if getting rid of a few rabbits is a simple process, but the truth is that there are animal welfare concerns that have to be kept in mind when dealing with rabbit control. This is particularly why it is difficult for people to take care of these issues themselves. We take animal welfare very seriously and keep fully aware of the new laws that govern these issues. Our team members have skilled backgrounds and lots of experience in dealing with these matters and our methods are guaranteed to be the correct ones. Our intention is to provide you with a carefree and safe service that deals with rabbit infestations humanely and without any legal backlash. We deal with problems that are both relatively small and that are hugely bothersome. From the protection of plants and trees, to removing rabbits that are running amuck in caravan and school parks, to stopping excessive rabbit breeding on valuable real estate properties, we aim to eradicate any issue that anybody faces when it comes to rabbit pest control. Our purpose is to ensure that people all across the UK will never feel that their rabbit problems will never be under control. We want to offer practical and realistic solutions to correct these issues in a reliable and reasonable way. It is with a combination of our team’s experience, skill and up-to-date methods of controlling rabbit infestations that we offer the best and most effective methods with which to get your rabbit concerns under control. Whether you need to clear out a huge field or property or a smaller area in between buildings or gardens, you can rest assured that we can cover your needs and that we can offer you the best options to deal with it. Rabbits are known to cause immeasurable damage not only to private properties but also to river banks and to plantings. It is often very difficult to gauge the level of destruction that these little, and very often underestimated, animals can cause to our environment. When it comes to stopping them before they’ve wrecked our homes and surroundings, don’t hesitate to ask us about our services for your region, to ask us about our advice and make sure that the rabbits in your area are not going to be the root of irreversible ruin. 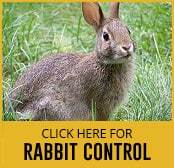 Our ambition is to help you stop these rabbits from attacking the areas that you love. We are always available to stop this wildlife from overriding the natural balance of the ecosystem. Don’t let their apparent lack of numbers fool you: underground rabbit burrows and warrens have devastating effects and their numbers are quickly multiplied in a short period of time. Avoid these issues by making use of our professional pest control services.